By Shaju Philip: A blooming lotus-shaped monument, symbolising universal peace, spirituality and fraternity, was inaugurated at Santhigiri Ashram, which was established by Navajyothisree Karunakara Guru here. The marvel in white marble and black granite has bloomed over the parnasala — a hall made of leaves — where the Guru lived until he left the world in 1999 at the age of 72. The Guru, who had founded the ashram in 1960, had led a simple life in a one-room tenement at the parnasala. His body was laid to rest here. As a mark of respect to the Guru, his disciples and followers have decided to reconstruct the parnasala — in the shape of a blooming lotus, at a height of 91 feet and a diameter of 84 feet. The structure has 12 petals upward with a length of 41 feet each and nine petals downward with a length of 31 feet each. The edifice has been erected on 12 pillars. 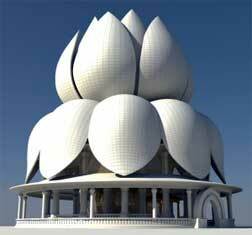 A 27-feet-high enclosure in the shape of a lotus bud with a marble cask inside, carved out of teak, would form the heart of the structure. Atop the cask, 11 steps would lead to a pedestal, where a life-size golden sculpture of the Guru would be installed. Under construction for the last ten years, the lotus structure would be dedicated to the world on September 12, the 84th birthday of the Guru. “In guru-disciple practice, lotus has a great significance. It sprouts from the mud, moves up and finally blossoms with the help of Sun. Similarly, we should move away from dirt in our life and bloom with the light from a learned man,” said ashram director Navananma Jnanathapasy. The design of the structure was not conceived by any architect. It was obtained through the “visions” of Amritha Jnana Thapaswini, the spiritual successor and foremost disciple of the Guru, said the director. According to structural consultant Sreekumaran Nair, the total cost of the project came to Rs 50 crore, which was largely mobilised from the contributions of the Guru’s disciples. The construction of each petal took six months.